Writing this column is fun, it brings back memories that time and god willing may be collected together into a book one day. 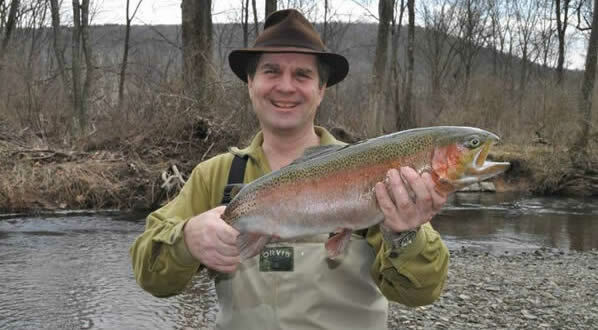 Meanwhile, this is written from a cabin in the hills of North Eastern Pennsylvania having just landed an 8 pound rainbow from the nearby stream – quite a red letter day of itself, it is not often that I put down a gun and pick up a rod, so in this case, I might well be described as a jammy bugger. Anyway, being in deer hunter country, my mind has turned to my favourite quarry, and, oddly to a wood in West Sussex about ten or fifteen years back. I was out looking for fallow with my old lever-action Sako Finnwolf .308, a rifle which I have owned for over 30 years (I shot the barrel out with military ball and had to send it back to the factory for re-barrelling). I have noted before I love to be in the woods stalking – whether or not anything is brought back is immaterial. I just love to a witness to the woods. On this occasion all that was brought back was my oddest stalking story of all. Walking down a ride, peaceful but alert, I was expecting deer. After about 10 minutes, deep in, I heard rustling to my left. I turned and saw something that will be etched in my memory forever. What was it? Not, what you expect in a Sussex wood, that's for sure. About two yards to my side there was a very large reptilian tail sticking out of some heavy, but low, cover. For a moment it was still, then it swished a couple of times, knocking the leaves about, and then, as suddenly as I saw it, this Jurassic phantom disappeared. That's it. But, it was one of the strangest things I have ever seen in a British wood. What was it, an iguana or some sort of escaped pet? I don't think so, it was just too large. The tail or part of the tail I saw was at least a yard long. It looked quite like a croc tail than anything else. Anyway, I went onto red alert, but not a trace of it did I find (which may have been a very good thing). I told my stalking companion about this when I walked out. He did not take much notice – I am not sure if he took me seriously. But, the memory of it has bugged me. True and Wonderfull. A Discourse relating a strange and monstrous Serpent (or Dragon) lately discovered, and yet living, to the great annoyance and divers slaughters both of Men and Cattell, by his strong and violent poyson. In Sussex, two miles from Horsam, in a Woode called St. Leonards Forrest, and thirtie miles from London, this present month of August, 1614. With the true Generation of Serpents. It seems that the dragon's preferred habit was "in a vast and unfrequented place, heathy, vaulty, full of unwholesome shades, and over-grown hollows, where this serpent is thought to be bred...This serpent (or dragon, as some call it) was nine feet, or rather more, in length, and shaped almost in the form of an axle of a cart." Witnesses, describe the beast "of Countenance very proud." On seeing man or beast he would "raise his neck upright, and seem to listen and look about, with great arrogancy."